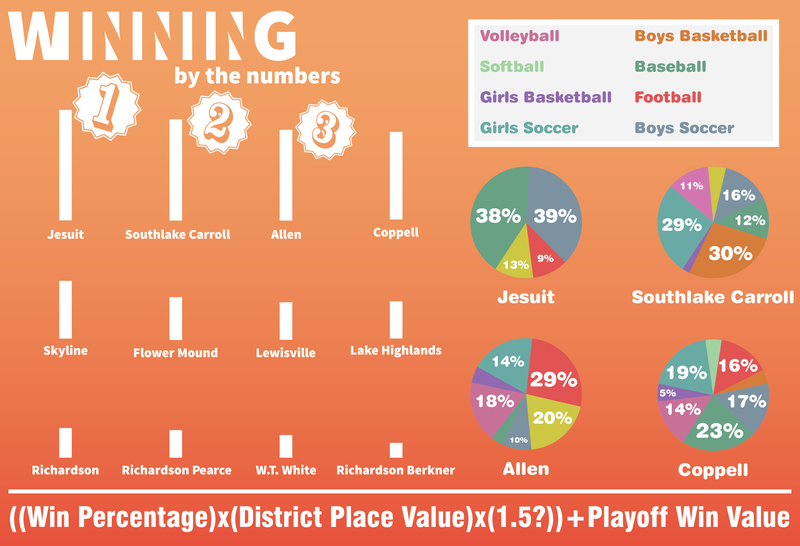 To rank the top sports programs in the area, an equation was created, placing emphasis on win percentage, playoff success and more. Jesuit finished on top, followed by Southlake Carroll, Allen and Coppell. High school sports programs across the nation are chock-full of next-level talents and future superstars. Cities such as Los Angeles, Las Vegas and Chicago are always listed amongst the most prolific in terms of producing college talent. However, right in the middle of this discussion is the Metroplex. 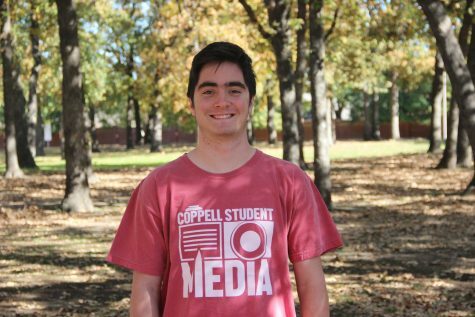 Coppell sports has nothing short of a storied history. But which school has the best sports program in this area? I decided to tackle this never-ending question by creating a numerical way to quantify the quality of a program’s last full year. In using the seven other District 9-6A teams and a handful of other local high schools, I tried to create a list pertinent on the minds of those trying to compare Coppell to regional rivals. So what is the “district place value” and “playoff win value”? It’s simple. To give value to how a team finished in the district standings, I simply counted backwards from the bottom. If a team finished last, the value was one, second to last it was two, and so on. For “playoff win value”, I added one point for the first playoff win, PLUS two points for the second, plus three more for the third, and so on. Potentially, a team could receive a total of 28 for the “playoff win value” if they win the state championship, because there are seven rounds of playoffs. The highest possible season (almost achieved by Jesuit’s soccer team) is 40, while the lowest (achieved by Richardson’s football team and Skyline’s softball team) is, of course, 0. Of course, I ran into the same problems anyone runs into when they try to quantify the unquantifiable; it’s not perfect. Not even close. For one, this equation did not take into account more than the most recent results of a team. For the Coppell football team, who made it deeper into the playoffs than it had in the previous five years, this was helpful. For the Coppell boys soccer team, who dropped from 40 points a year ago to 11 points this season coming off last year’s state championship, it hurt. If I had either a whole lot more time (or a whole lot more help), I could’ve run this equation for the last five years. Another problem I ran into was the fact that baseball and softball seasons are not yet finished, so last year’s data was what was used in the equation. So in that case, it used last year’s state champion Jesuit baseball team, rather than this year’s team that will likely finish in second in District 9-6A. Again, some teams were helped by this, some teams were hurt. Again, in this equation, it is quantifying the unquantifiable. There are so many aspects of a team that you can’t put into numbers: team chemistry, success of individuals on the team, heart, etc. And again, this equation is not perfect, but it is a step towards a measure on the quality of each sports program in the area this year. Talk about a well-rounded sports program. Although it only runs boys sports, the Rangers scored above nine in each of the four sports, and, due to the boys soccer and baseball state championships, finished on top. The dominance in those two programs allowed Jesuit to overcome a bit of a low score in football to end up at No. 1. As Coppell’s biggest rivals, the Dragons always pose a threat as a championship-caliber team in most of the major sports. As an always solid football team and stellar boys and girls soccer program performed well this last year, Southlake Carroll only fell well short of Jesuit in boys basketball, where a .500 record did not allow for a playoff appearance. Traditionally known as a football powerhouse, the gridiron is what Allen leaned on for the bulk of this year’s points. A state semifinal berth gave the football team over 21 points, nearly 30 percent of the Eagles’ points. Their only shortcomings came in baseball, girls basketball and softball, where .500 or below seasons and only one playoff win between the three teams allowed for little points to be gained. The Cowboys were very, very close to cracking the top three on the list. An appearance in the regional quarterfinals in football, volleyball, boys and girls soccer and baseball gives Coppell a boost in the rankings. If only this year’s dominant softball team could be included in this mix, the Cowboys and Cowgirls might have been able to edge out a few of the area’s top three. For now, however, they sit in fourth. While the Raiders had a down year in football (for their high standards), they made up for it with an incredible basketball season. Led by senior Kansas commit Marcus Garrett, the boys basketball team made it all the way to the state semifinal, while the girls squad finished as the best of the teams in this ranking. Those two teams picked up 84 percent of Skyline’s total points.